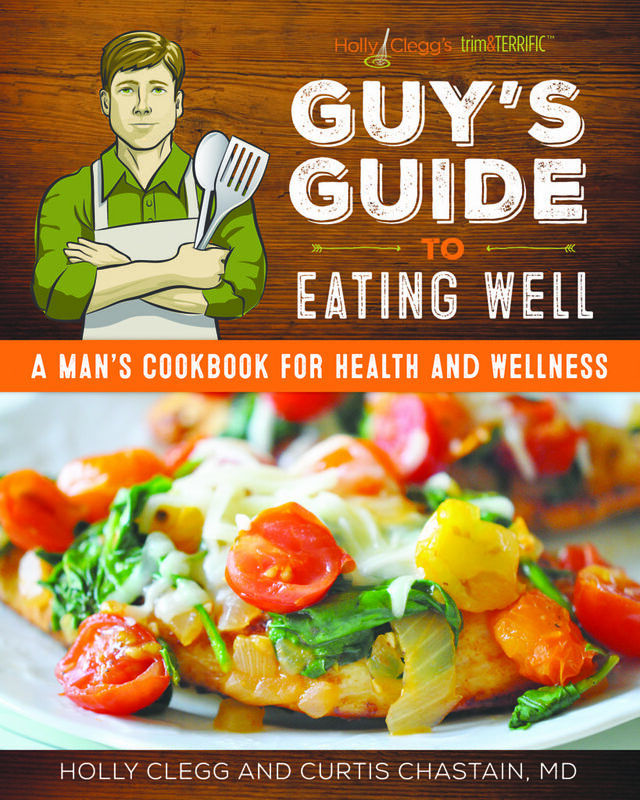 Here is a sampling of recipes from A Guy’s Guide to Eating Well: A Man’s Cookbook for Health and Wellness, which Berkowitz dedicated to her father Jerry, who passed away on Sept. 20, 2017, after battling laryngeal cancer for 17 years. Move over bar food and munch on these simple, crunchy chips that melt in your mouth. 1. Preheat oven to 400 degrees. Line baking pan with foil and coat with nonstick cooking spray. 2. Spread kale on prepared pan in single layer. Coat kale lightly with nonstick cooking spray. Season to taste. 3. Bake 8-10 minutes or until kale is crispy and edges brown. Highly requested simple, stand-up kind of appetizer everyone gravitates to. From the “Fix it Fast or Fix It Slow” chapter. 1. Preheat oven to 325 degrees. Coat baking pan with foil. 2. Remove wrappings from salami. Score diagonally with knife in both directions creating diamond cut and place salami on prepared pan. 3. In small bowl, mix together preserves and mustard. Spoon sauce over and inside salami cuts. Bake about 1 hour, spooning sauce on top salami halfway through cooking or until salami is crisp. Nutritional info per serving: Calories 145, Calories from Fat 57%, Fat 9 g, Saturated Fat 3g, Cholesterol 31mg, Sodium 521mg, Carbohydrates 10g, Dietary Fiber 0g, Total Sugars 9g, Protein 6g, Dietary Exchanges: ½ other carbohydrate, 1 lean meat, 1 fat. 1. In 3½- to 6-quart slow cooker, pour salsa on bottom. 2. In small bowl, mix chili powder, cumin, paprika, garlic powder and season to taste. Season meat with all seasonings. Add meat, remaining seasoning, onion and peppers. 3. Cook on LOW 8 hours, or HIGH 5-6 hours or until tender. Use slotted spoon to remove meat, onions and pepper. You’ll be surprised how simple ingredients like lemon and garlic turn broccoli into a delectable, delicious vegetable. 1. Preheat oven to 425 degrees. Line baking pan with foil and coat with nonstick cooking spray. 2. Toss broccoli with garlic and olive oil. Spread on prepared pan. Season to taste. 3. Roast 18-24 minutes or until crisp tender and tips browned. 4. Remove from oven and toss with lemon zest and lemon juice. Broccoli is an anti-inflammatory powerhouse, rich in antioxidants, Vitamin C and carotenoids. Yes, you can fix this dynamic dessert and appear “fancy!” Pick up at the store a chocolate crust, ice cream, pistachio pudding and chocolate topping, for a frozen creamy melt-in-your-mouth nutty dessert. 2. In 9-inch pie plate, stir together graham cracker crumbs and butter; press on bottom and up sides. Bake 8–10 minutes. Cool completely. 3. Meanwhile, in a large bowl, quickly combine the pistachios, ice cream and pudding until well mixed. Transfer mixture into cooled crust. Freeze, covered, at least 4 hours or until firm. Serve with warmed chocolate fudge topping on each slice. Take a shortcut and use a prepared chocolate crust from the grocery.